Coffee. Everyone loves it. Everyone’s keen to find the next best thing in the world of tasty hot brews. You might grudgingly find yourself at your local chain coffee shop but there’s a whole world out there of more exciting flavors and experiences. We’ve taken a look at 10 great apps for ensuring you’ll know how to concoct the perfect brew, how to find the best shop bought coffee and even how to create wonderful coffee art. KoHi is primarily a coffee brewing timer, backed up by numerous other useful features for the keen coffee brewer. Its advanced calculators and timers ensure you can simply tell the app how much coffee you want to brew, and it figures out the exact amount of beans and water you require to make the ideal cup. It supports numerous brewing methods, and offers a recipe manager for extra convenience. If you own an AeroPress, this is an essential purchase. It offers a catalog of carefully curated recipes, with step-by-step instructions to ensure you’ll create the perfect cup of coffee. Also working via your Apple Watch, it’s the ultimate recipe book for your AeroPress needs, and a great way of trying out different blends. coffee.cup.guru offers 30 recipes for a variety of different coffee making methods. In each case, attractive animations guide you through the paces, along with statistics on everything you could possibly want to know. Recipe evaluations as well as a history section ensure you can keep track of what were your favorites and what worked out particularly well. Brewseful’s focus is on simplicity. It’s a minimalist timer that helps you keep track of things, step by step. You can add events partway through the brew time, calculating water grounds ratios, and keeping an eye on how well ground the beans are. In each case, you can save custom brew timers for later use, meaning a more personalized experience in the long term. It’s ideal for the more experienced coffee enthusiast. SlowBar offers a number of different brew recipes that have been hand selected from top coffee shops and roasters. It caters for brewing methods such as AeroPress, French Press, and Chemex, along with others. Each step of the recipe is simple to understand with timers to ensure you don’t fall behind. Cupper helps you find the best coffee near you, providing you live in one of its catered cities. Each coffee drink is graded on a 1 to 10 scale with the quality score taking into consideration – aroma, flavor, acidity, aftertaste, body, balance and more. You simply search for coffee, depending on if you’re looking for espresso, latte, pour over or cold brew, and Cupper tells you where to go. Intelligentsia Coffee offers a wealth of information on coffee, as well as the means to buy high quality products. You can check out brewing instructions for multiple devices, consult the customizable brewing calculator, and adjust everything to different quantities of measurements. An updated timer keeps an eye on progress, while you can order more coffee with one tap. Acaia Coffee appreciates that you probably try a lot of different coffee each week. It’s a form of diary and social network for your coffee consuming habits. You can use it to record what you’re drinking and where, before sharing it with others. That means learning about great brews near you, plus you can record brewing processes along the way. Ever wanted to create coffee art and not known where to start? Art of Coffee teaches you how to create over 30 designs, incorporating both etching and free pour techniques. In no time, you’ll be able to create rosettas and more complex designs on the top of your drink. Its step by step instructions, photos and videos will ensure you know what to do. 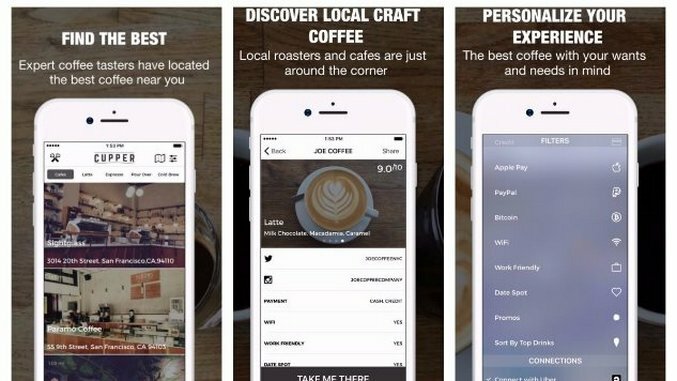 Beanhunter hopes to find you the best coffee in your area. Available in over 180 cities, the app offers all the latest news on coffee trends and new cafes. You can browse through listings, pictures, and user reviews, as well as share your own experiences. It’s great for finding a hidden gem.